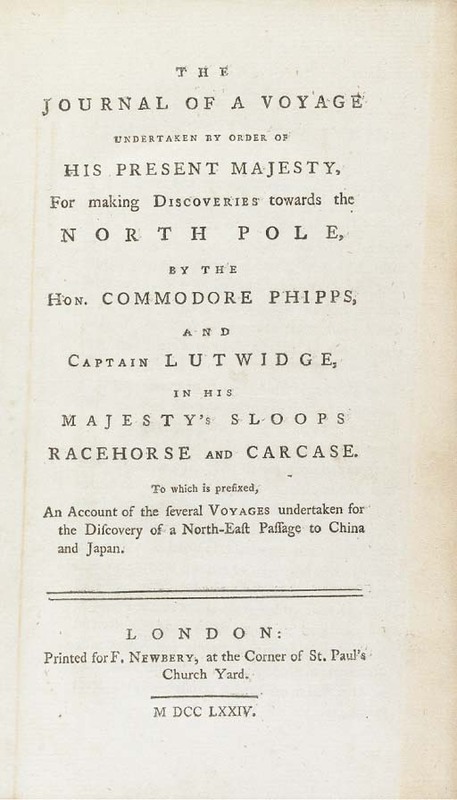 The Journal of a Voyage undertaken by order of His Present Majesty, for making discoveries towards the North Pole, by the Hon. Commodore Phipps and Captain Lutwidge, in His Majesty's Sloops Racehorse and Carcase. London: printed for F.Newbery, 1774. 8° in 4s (199 x 123mm). 2 folding engraved maps, engraved plate. (Lacking front [? ]blank, the maps shaved into image area along lower edge, the circumpolar map with small tear to fold.) Expertly bound to style in modern speckled calf, red morocco lettering-piece. 'This expedition, undertaken for the purpose of discovering a route to India through the north polar regions, was blocked by pack ice north of Spitsbergen... The voyage is perhaps better remembered for the presence of young Horatio Nelson, as midshipman aboard the Carcase, and his encounter with a polar bear. This is the narrative of some member of the expedition, containing particulars not given in the official account' (Hill I,p.207). Hill I, p.206; Sabin 62573.